Welcome to the World Shakespeare Project (WSP), directed by Sheila T Cavanagh (USA). Experimenting with new technologies that allow real-time interaction between students and faculty worldwide, the WSP offers an alternative pedagogical experience. Regardless of location, race, religious creed or financial status, students and faculty share live interactive classroom exchange. Shakespeare's universal narratives provide the common currency. Alternative voices populate this artistic and cultural exchange as languages and regional dialects resonate through its community. 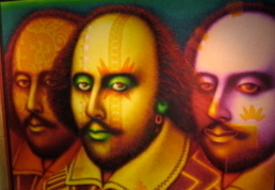 The WSP provides the platform – the virtual global 'stage' – for these alternative Shakespeares. Discover the WSP's role in uniting the world of Shakespeare, and how international Shakespeare discoveries can be seen and heard 'live' by the world.